Pvc bag containing 150 gr chocolate coins. 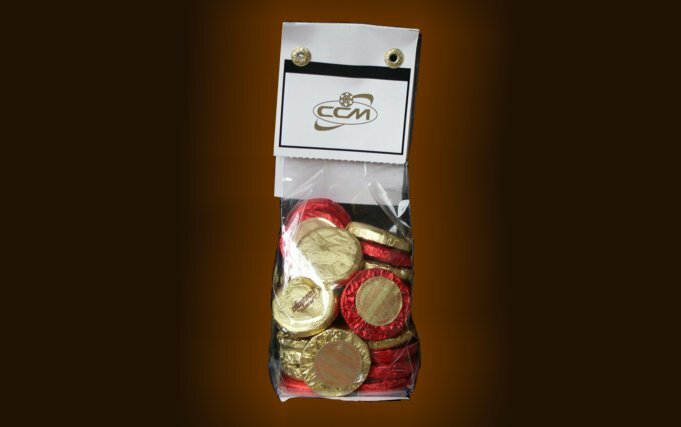 Transparent bag containing 150 gr chocolate coins with custom label. Trasparent bag containing 150 gr chocolate coins. Transparent PVC bag containing gr. 150 customized chocolate coins with stiff board personalized label and closed by two eyelets. Label showing technical details as required by current regulations is on the bottom of the bag. Dimensions and weight : Length base 60 mm. Width base 40 mm. Height 120 mm. Weight : 150 gr. Colors available package : Trasparente.